A revealing, often disturbing look at what goes on in doctors’ minds when treating patients, plus some advice to patients on how to work with their doctors to improve that process. Oncologist and New Yorker staff writer Groopman (The Anatomy of Hope, 2004, etc.) draws on conversations and interviews with other doctors, research in the field and his own experiences as both doctor and patient to unravel the question of how doctors reach a diagnosis and decide on a treatment. While the clinical algorithms and practice guidelines that medical students are taught and that are promoted by hospital administrators and insurance companies are useful in many cases, he argues that they discourage doctors from thinking creatively when symptoms are vague and test results inconclusive. 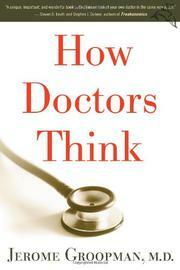 Groopman categorizes the kinds of errors in thinking that doctors can make (drawing on stereotypes, thinking too narrowly, clinging to an original diagnosis while ignoring later evidence), and he uses real cases as examples. In one, doctors who diagnose a Vietnamese infant as having a rare inherited disease are only persuaded otherwise by the adoptive mother’s insistence on retesting her blood. In another, various doctors continue to accept an initial misdiagnosis over a 15-year period until one doctor makes the correct diagnosis by taking the time to question and observe the patient closely and pay attention to her answers. When Groopman receives four different diagnoses and plans for treatment for his painful, inflamed right hand, he consults a fifth specialist, and together they analyze the types of cognitive errors that led to the series of misdiagnoses. His revelations about the performance records of radiologists and others who must read and interpret tests will be disconcerting to anyone expecting technology to produce certainty, and his chapter on the influential marketing tactics of pharmaceutical manufacturers will dismay those expecting doctors to demonstrate objectivity. In an epilogue, Groopman speaks directly to the would-be patient, offering pertinent questions that one might direct to his or her physician to promote broader thinking about an ailment.